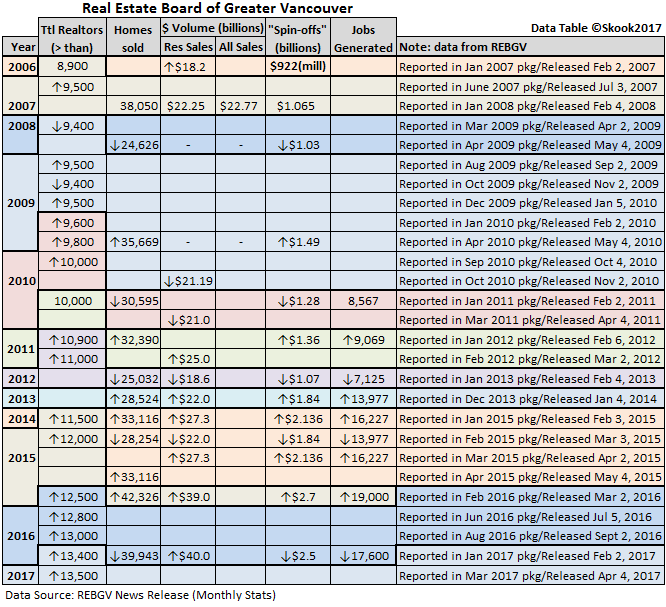 Every month the REBGV publishes a News Release along with the Board’s real estate sales stats. Both are loaded together in a .pdf file that you can download from the Board’s website.In the News Release, there are two to three paragraphs of small type (it can vary) to be found towards the bottom of the second page. I read that small type one day and whistled. There were some interesting figures in that blurb such as the yearly number of homes sold board-wide, the dollar volume of those sales and of all sales combined. The information that I believe was most important to the REBGV to disseminate was the overall economic impact of Real Estate on the BC economy both in jobs and money generated. It is hard for government to ignore an industry that is adding billions of dollars to the provincial economy. The blurb contained another juicy tidbit - how many Realtors® were registered with the board. I wanted to see how this number and all the other numbers changed over time so I delved back as far as I could go (2001), noted the numbers and created a table. Generally, the economic data for the preceding year is released in February; however, there have been exceptions such as in 2009 (US financial crisis) when data was released as late as October 2010. For 2013, the data was released in January 2014 – the only time for such an early release; likely due to how Christmas holiday dates fell. 2014 shows some bizarre reporting probably due to inadvertent carelessness. I’m thinking whoever prepared the Feb 2015 report likely pulled up an older 2013 template, copied and pasted the new monthly letter but forgot that “spin-off blurb” info may have changed. As you can see, it took a few months to straighten the goof. Cellphone use is having a major impact on websites. Everyone is now reverting to dynamic sites that function well no matter the platform: desktop, laptop, notebook, iPad and cellphone. In this transition to these new websites, valuable data is being purged and this applies to real estate statistics. There is one website and one website only that I know of where you can download REBGV stats packages going back to 2001 and that is here. The REBGV archived all its monthly News Releases since time immemorial but only thought to include the stats starting in January 2013 (Jeez...slap my forehead). Well, knowledge is power as they say and you don't want the plebs to get too smart. So, if you think you might ever have need of Vancouver’s historical real estate stats I would set aside an afternoon and download them while the getting is good.